Maurice Meade is a well-known and popular Sligo based artist. A native of Cork, Maurice Meade graduated from Crawford College of Art in 1972 immediately afterwards taking up a teaching post with Sligo VEC. Shortly afterwards, Maurice was a founder member of Sligo Art Gallery. Solo exhibitions include Sligo Art Gallery, The Hamilton Gallery Sligo, and The Origin Gallery Dublin. He has also exhibited in group shows such as the North West Artists Exhibition at Sligo Art Gallery, Boyle Arts Festival, The Hermione Art Exhibition, Alexandra College, Dublin, Kennedy Art Gallery, Harcourt Street Dublin and the Lavit Gallery, Cork. Public clients include Stiefel Laboratories Inc. Sligo and Co. Sligo VEC. 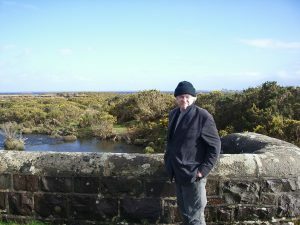 He was awarded three residencies at the prestigious Cill Rialaig Artists Retreat set in a restored pre-famine village in Ballinskelligs, Co. Kerry founded by Dr Noelle Campbell-Sharp. Between 1980 and 1996, Maurice held a number of senior posts with the Department of Education: Chief Advising Examiner, Education Officer on the Curriculum Examinations Board, and NCCA Education Officer for Art, Craft, Design. Maurice played a pivotal role in the formulation and implementation of the innovative Junior Cert Art, Craft, Design syllabus which was introduced to schools nationally in 1989.